Should I Choose Slate for my Kitchen Floor? 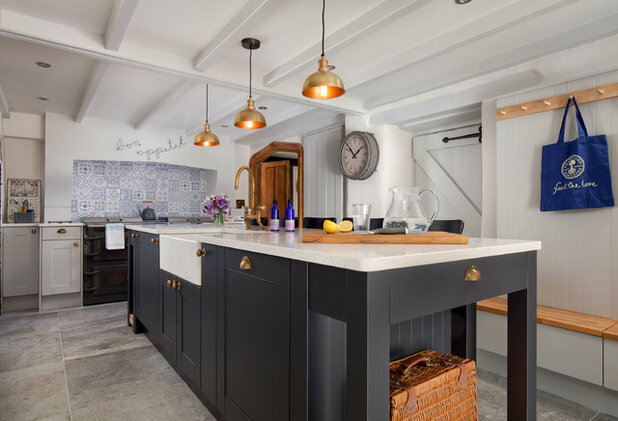 Whether you’re going for a textured, cosy look with riven tiles, or a smart honed finish to complement modern units, slate floor tiles are a great option for a kitchen. 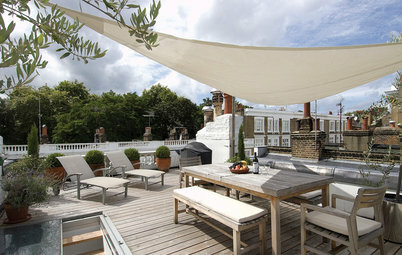 Some slates are tougher than others, so research the best options for a high-traffic area. 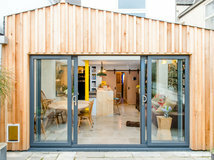 More in this series: Should I Choose Parquet for my Kitchen Floor? 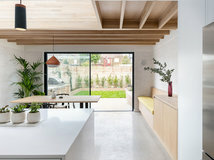 l Should I Choose Polished Concrete for my Kitchen Floor? 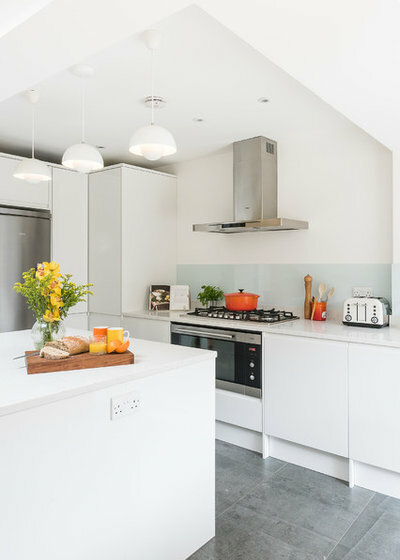 l Should I Choose Limestone for my Kitchen Floor? 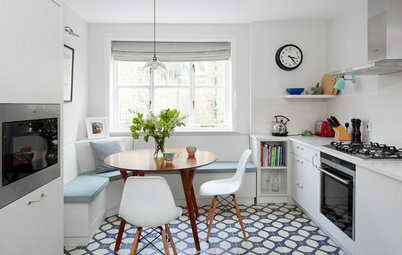 l Should I Choose Patterned Tiles for my Kitchen Floor? 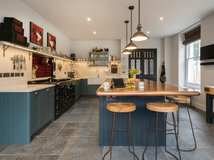 The wood cabinets in this kitchen give a natural feel to the space, but to keep the room looking smart, the designers have chosen a slate floor. 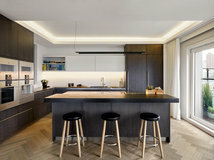 The dark grey tiles and honey-coloured cabinets complement each other to create the perfect balance between warm and cool. Slate tiles can be uniform in texture and colour, or they can be more varied, like the ones here. The different sizes, shades and textures of these tiles have formed an interesting patchwork on the kitchen floor. The white units ensure the space feels uncluttered and help to showcase the tactile patterns and tones on the floor. 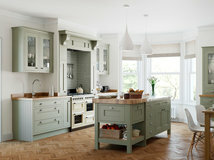 This farmhouse kitchen has been given a snug feel with a mix of cream and blue-grey surfaces. 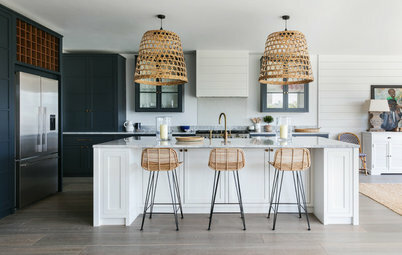 The bottom half of the room is a lot darker than the top, which creates a nest-like effect – and the dark slate floor is the perfect base for the cosy farmhouse table. 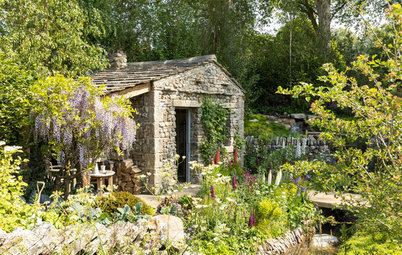 Slate is the ideal material if you’re going for a rustic look. 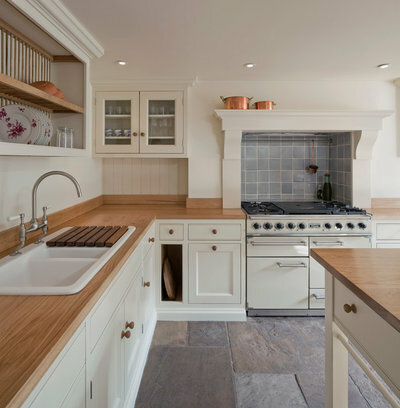 To really achieve the feel of a country cottage, choose slabs with a rough edge. Here, the large tiles look robust and the uneven edge suggests they’re aged and well-worn. 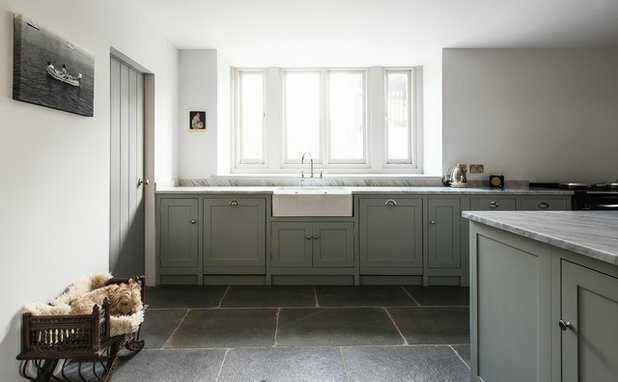 Highlight the dark colour of slate by teaming it with pale units. 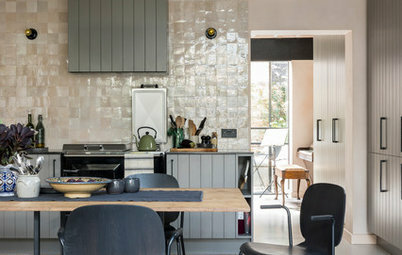 These deep grey tiles are the ideal surface against which the light grey cabinets can stand out. 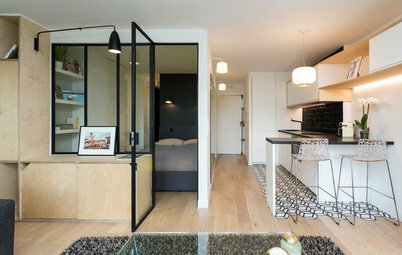 The freestanding style of the cabinetry lifts the units off the floor slightly to maintain an airy feel in the space. 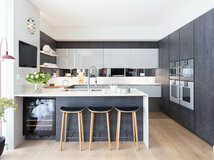 The designers of this kitchen have incorporated two tones of grey for a look that’s both chic and dramatic. 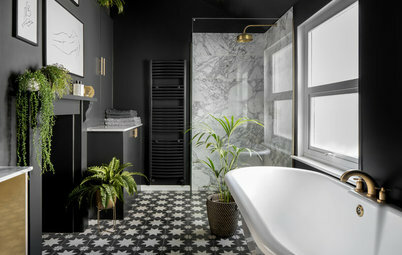 The quality feel of the slate floor ties in with the marble and brass finishes to give this space a high-end, luxurious feel. 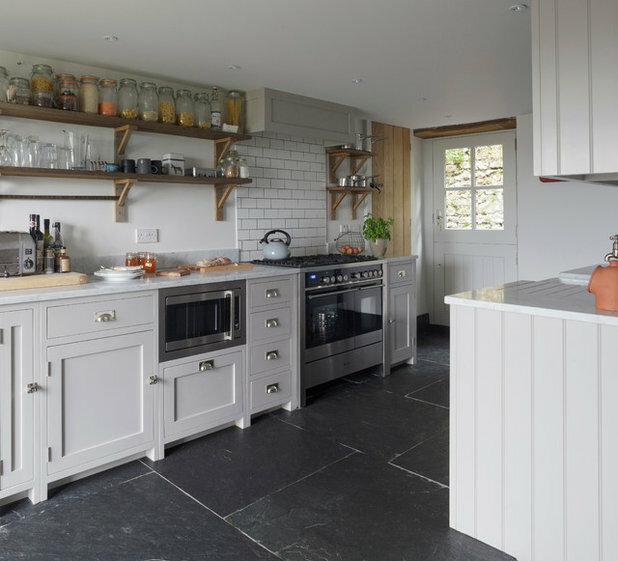 Slate doesn’t just look stunning in a rustic setting, it can be as beautiful in a modern kitchen, too. These sleek, contemporary units are teamed with mid-grey slate floor tiles, which add a natural texture to the scheme. 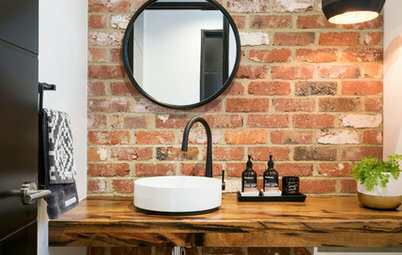 If you’re laying a slate floor in a contemporary room, go for a honed finish, and choose straight edges to keep the grouting thin and streamlined. 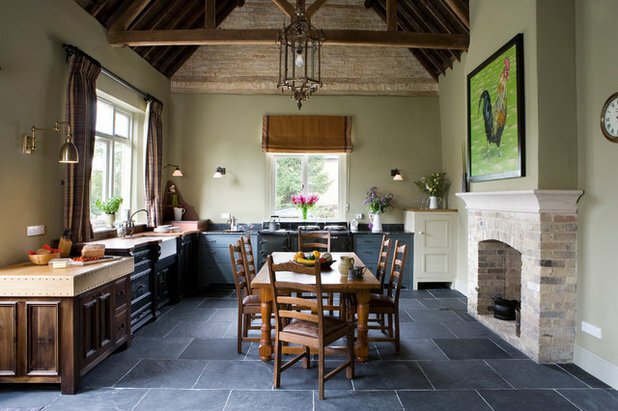 Have any of these beautiful rooms inspired you to choose slate for your kitchen floor? Share your thoughts in the Comments section. 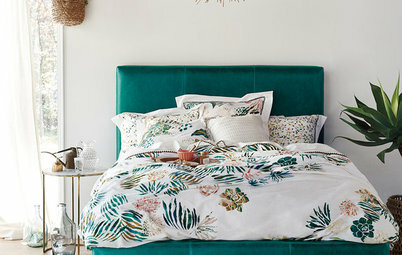 Some beautiful ideas! 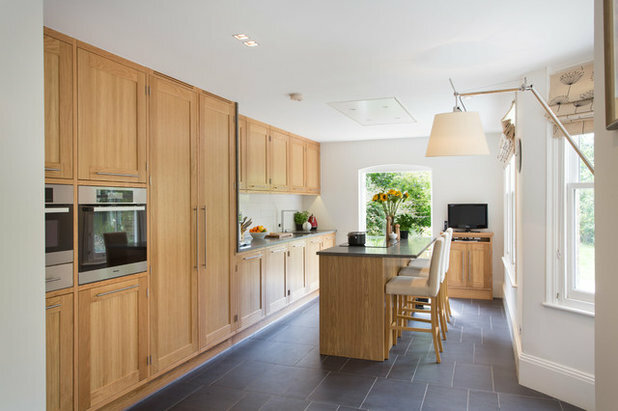 We chose it for this country style kitchen, with underfloor heating installed to add warmth to the room. 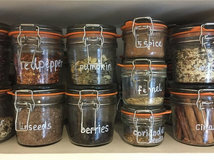 Perfect for houses with lots of paws! I do love this type of flooring. You show some stunning examples, Amanda. 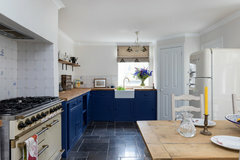 I had the most gorgeous riven slate floor in another kitchen once upon a time. Yes, cleaning poses more of a problem than tiling with a smooth finish and it's not a surface that resists breakages but it certainly doesn't show the dirt.